I've invited my Southern Magic chaptermate Julie Johnstone to guest blog today. Julie has a novella in the Regency Christmas Summons Collection I, available in ebook. She also has prizes up for grabs, so be sure to give her some comment love! First of all, a huge thank you to Paula for having me on her fabulous blog! Now, I know you all are laughing at my title! I can hear you all the way over here! I too was a non-believer of having Thanksgiving for twelve people at my house without stress until I followed a few simple steps. Before I tell you all my greasy turkey secrets, you need to know what led me down this path of stuffing enlightenment. Being the type A, dream big, holiday nostalgic nut that I am, every year for the past five years I have envisioned the perfect Thanksgiving dinner at my house. I have enthusiastically invited my mother, in-laws and siblings to our house. Then I spend several weeks before Thanksgiving dreaming of serving the juiciest turkey, the moistest stuffing, and the richest Bourbon Bread Pudding, to name a few of the dishes. Every year, I get up at the crack of dawn to get Thanksgiving dinner started, and I slave all day long to make sure everyone has the perfect meal. At the end of the day, after many trials and tribulations, I am exhausted, have barely spoken to any of my relatives, and have yelled at my children at least eight times, and snapped like a pit bull at my husband to the point that he refuses to come into the kitchen. Needless to say, I have managed to produce a Martha Stewart like Thanksgiving for those I love, but never enjoyed the experience until last year. I did a little research, followed a few simple steps and had a glorious Thanksgiving that I actually enjoyed. If you are like I was and bend over backwards to present a fabulous spread that just about drives you into the loony bin, I want you to take a deep breath, trust in your fellow type-A hostess, and follow my advice. 1. Make a plan – Make a guest list and then plan your menu at least two weeks in advance. Make a shopping list and then two weeks before T day check that you have the required spices, kitchen tools and yes, enough chairs to seat all the lucky people you’ve invited. 2. Shop one week before Thanksgiving. If you wait, you will be fighting someone for the last bag of pecans or the 40 pound turkey you just have to have. 3. Make some of your dishes ahead. Do not create a menu chalked full of dishes that must be made on Thanksgiving Day. If you do have several dishes you have to make that day, distribute them evenly between the stove, oven and microwave. 4. Avoid the ‘new’ unless you taste to see if it’s true. In other words, if you are making anything new, using new kitchen equipment or even serving an unfamiliar wine, have a test run. How hard is that? If you need me to test run your wine, just call me! 5. Manage your munchkins! My kids love to be underfoot. I have learned to stock new DVD’s just for T day. Also, my four year old loves to “cook.” I now let him bake cookies and decorate them on my island away from the major preparations. 6. Don’t feel you must provide an overabundance of appetizers. Keep it simple! Your guests will thank you, and if they don’t their waists will! 7. Make sure to give yourself plenty of time to defrost the turkey. I learned the hard way that three days is not always enough! 8. Everything doesn’t have to be homemade! Shh!!! I didn’t say that. Add your own special flair, put it on a great piece of china and voila—a grand creation. 9. Plan something to do after the eating is over. Here are some ideas: games, movies, decorating the Christmas tree! 10. Have fun! Don’t stay in the kitchen the whole day! Now that I have conquered Thanksgiving stress, I’m going to work on mastering Christmas Mayhem! As a Regency romance writer, thinking of the holidays got me to contemplating if the women of the ton were ever stressed to present a perfect Thanksgiving or Christmas dinner. Somehow, I doubt their worries compared to mine, as most of the ton had a legion of household servants. However, having all those servants always seems to free up my characters to get into some sort of mayhem. And there’s no better mayhem than the chaos between rakes and the women who love them. If you’re looking for a way to escape the noise of your house on Thanksgiving try downloading the new anthology I’m part of, A Regency Christmas Summons. 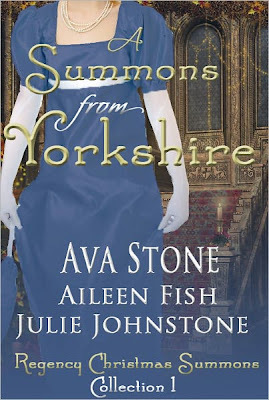 You can find my story, The Gift of Seduction, along with Ava Stone’s and Aileen Fish’s in, A Summons From Yorkshire. Charlotte opened the door, her stomach tensing as Salisbury breezed into the room, resplendent in navy blue formal dress. He was a beautiful man, with his russet locks and piercing green eyes, and she should be ecstatic he wanted her. Instead, a mild queasiness filled her. “Lottie.” He closed the door behind him and drew her into his arms. She forced herself not to turn her head to the side when he pressed his lips to hers. A small, irrepressible shutter ran through her body. “You’re nervous?” he asked, stroking a hand over her hair. But it was her first time with a man she didn’t love. Drew had been her first, her only. Laying with him, his exquisite feather-light fingers down her chest, over her stomach, between her—she squeezed her eyes shut. “Lottie, come sit,” Salisbury said, taking her hand and leading her to the settee. She followed him and sat while making an effort to compose herself. “Thank you, Salisbury,” she said reaching for the glittering diamond ring he held between his index finger and thumb. She fought the tide of disappointment that wailed within her. She had imagined this moment a thousand times, but it had always been Drew sitting on the other side, and their future had been bright with the promise of love. Foolish, stupid girl. That sort of love only existed in the fairy tales her mother had read to her as a child. “You’ve kept your part of our bargain perfectly,” she murmured. She reached for the tie of her dressing robe, but her shaking hands made undoing the knot impossible. “I’m sorry,” she whispered, willing herself to go through with her plan. She wanted to lay with Salisbury. She wanted to replace the memory of Drew with another man, the man who would be her husband. Why did her heart beat so hard it echoed through her entire body and set her teeth to chattering? She clenched down against the noise. Charlotte’s heart dropped to her bare feet. What to say? She scrambled for the right words, but a loud knocking and a harsh, clipped, “curtain’s going up in five,” saved her from having to respond. A lifetime? Why did it sound like a death sentence? Charlotte took a deep breath and plastered a smile on her frozen face. She was good enough to marry into the ton, and to be good enough, she needed to shove her silly girlhood fantasies into the darkest recesses of her mind where they could damn well stay gathering cobwebs. “I’m looking forward to forever,” she lied. Determined to make a grand exit, she lifted her chin and turned away to walk elegantly, like the duchess she would be, down the bustling corridor. Her foot caught in the long hem of her gown, causing her to careen forward with a yelp of dismay. She threw her arms out to catch herself, but instead of a jarring hit, a strong pair of hands slipped under her arms then proceeded to draw her up into a circle of heat and steel. Her heart jumped in a way it had not jumped in almost a year. Maybe she was not dead inside, after all. She glanced up to thank her savior and stared in numb silence into aqua blue eyes, surrounded by long sooty lashes set in the face of a dark devil. “Release me at once,” she hissed at Drew, as the heat of longing and desire danced up her body, flushed her chest, and singed her face. The hounds of hell indeed. Satan was holding her in his arms, and she was not about to be dragged back down into the pits of hell, otherwise known as love. Now back to Turkey time! Do you have any tricks for making T Day stress free? ***Everyone who leaves a comment today with an email address will be entered into the Regency Christmas Summons Prize Extravaganza. We're giving away a Kindle and many more prizes. For years I hosted Thanksgiving for up to 40 people. I cooked for five days and made everything from scratch. I accomplished it all doing almost exactly what you recommended. Some of my most liked side dishes were unknowns. Preparation is always the key. zeguestlist is an amazing tool for managing all your events and parties. Great tips! I don't usually host Thanksgiving, because it is my mother-in-law's favorite holiday. I do have lots of people over for other occasions, though. I've found that a simple meal is just as enjoyable as anything elaborate, because it's really about the company. The thing I've heard over and over from guests is how relaxed they feel in our home. I agree with everything you said, oh wise leader! ;D We always try to divvy up the dishes between my parents house and mine, then combine them on Thanksgiving, leaving on the things that cannot be cooked ahead of time -like the turkey. It's surprising how much can be done the day before and just re-heated and taste the same, lol! Great advice, Julie -and great passage from your novella. I think I will go to my daughter's house (Julie) and let her cook the turkey! That seems so stress free to me! I love making Thanksgiving dinner. I've done it every year for my family since I was just teenager. Over the years, I've perfected judicious use of my time. LOL. My best tips? Brine the turkey, and it'll be fabulous. Plan side dishes that take about 30 minutes in the oven, and prep them while the turkey is baking. Then, when the turkey comes out to rest, pop the sides in. Once they're done, the turkey has rested and is carved, and everything is ready to eat at the same time. Buy as much pre-prepared as you can. If you need grated cheese for a dish, don't buy a chunk and grate it yourself--buy the cheese already grated! If you need chopped pecans, don't buy whole pecans that you have to shell and then chop. Save yourself as much hassle as you can. Forty people! Wow! I'm impressed. I'm glad you liked the excerpt! Thanks for stopping by! I've never heard of zeguelists. I'll have to check it out. Thanks for the tip! Smoked turkey sounds yummy! I may have to try that! Thanks for stopping by! I'm glad I'm not the only one who thinks everything doesn't have to be homemade. Thanks for stopping by! I'm glad you liked my passage! Great tips on buying pre-prepared ingredients such as grated cheese and already chopped onions. This is one time of year, I'll gladly pay a little extra! Captain Dave! Come on over! Those are great tips, Julie, but you forgot the most important one: have it someone else's house!! LOL! I'm kind of wishing I was coming to your house this year - you had me at Bourbon Bread Pudding!!!! Oh, and I can't say enough about your amazing story!! LOVED IT! Great tips! I love the everything does not need to be homemade one :) I am always in charge of desert for the holidays and since my kids are just 17 months apart, there were a few years where I just didn't have time or energy to make some fancy desert so I got the premade cheesecake in a tub and it was surprisingly good...and really easy lol :) But now they are old enough to 'help' so we find something to to together. My mother owns Thanksgiving and is not really open to change. The main thing we end up doing is bringing pies for the pie party that happens the night before Thanksgiving. I make two retro peanut butter pies, and now that my daughter is old enough she makes an Oreo pie. Having at someone else's house is a brilliant idea! I love the cheesecake in the tub! Having the kids help can be fun! I love the idea of a pie party! That sounds like so much fun! What's a retro peanut butter pie? Thanks for stopping bye and saying hello! I love holidays, so I do tend to go overboard! Julie- I found the recipe for Retro Peanut Butter Pie at my dentist's office several years ago. It is the easiest pie in the world, but always a big hit. I sprinkle mini peanut butter cups all over it, instead of just around the edge.